There is almost no need to introduce this review at all. If you are into vaping, you already know that the Volcano Vaporizer is the Rolls Royce of vaporizers. Because the Volcano doesn’t really look like any other vaporizer. With its sleek stainless steel housing, it looks like some amazing futuristic device—maybe not just the Rolls Royce of vaporizers, but the rocket ship of vaporizers. But how does it actually perform? Does it live up to all the hype? I purchased the Volcano Vaporizer and gave it a try to find out if it really is the best desktop vaporizer. Let’s check it out! First things first. I don’t want to just assume outright that you know all about vaping, so let’s review the health benefits quick. Vaping is a unique process which releases the aromatic compounds in herbs without actually burning them. This means that combustion never takes place, and none of its dangerous by-products (i.e. carbon monoxide) are produced. That means that the vapor (not smoke!) produced by the Volcano Vaporizer has incredible purity. You get the essential compounds released through the vapor without the dangerous compounds that damage your lungs when you smoke. 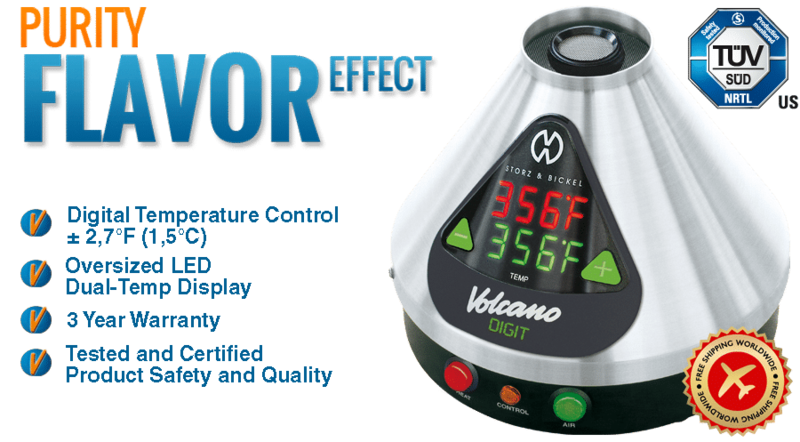 If you are using the Volcano Vaporizer for cannabis, the vapor consists of 95% cannabinoids. So you are getting a higher concentration—and you are also preserving your supply. Combustion burns through materials rapidly, quickly exhausting your cannabis. The Volcano Vaporizer allows you to extend the cannabis you have for as much use as possible. Over time, this actually saves you a lot of money. Now, onto the design and materials of the Volcano Vaporizer. As already mentioned, this device has a sleek, beautiful design, and is made out of stainless steel. German-engineered, it was built to stand the test of time. All materials used are heat-resistant and food-safe. It is the only vaporizer on the market which meets the quality standards set by ISO, UL and NRTL. There’s a 3-year warranty direct from the manufacturer (STORZ & BICKEL) backing your purchase. The cone shape looks pretty cool, but it is also functional; it prevents it from falling over. The tip also provides a useful attachment for tubes, etc. Between the two there is a steep price difference. The Digital model costs around $100 more than the Classic model. For the most part, in terms of functionality, the two devices are pretty much the same. But the Digital version allows you to input a specific temperature. The Classic model relies on a knob for input. That means you can be a lot more accurate with the Digital model. So if fine-tuning is important to you, you may want to consider the extra expense. This version includes a 30-minute automatic off switch as well. For me, that alone made the upgrade a no brainer. The Classic model is accurate to within around 9 degrees Fahrenheit; for most users, that slight amount of variance is not going to matter. The temperature range for the Digital model is however significantly wider—about 40-230 degrees Celsius vs. 130-226 degrees Celsius for the Classic model. So I’d recommend the Classic model if you are on a budget and are not too picky about temperature control (most buyers will still be happy with what they get) or worried about leaving the desktop unit on. But if you can afford the added expense and a high degree of accuracy and safety is important to you, the Digital model can be worth the extra money. 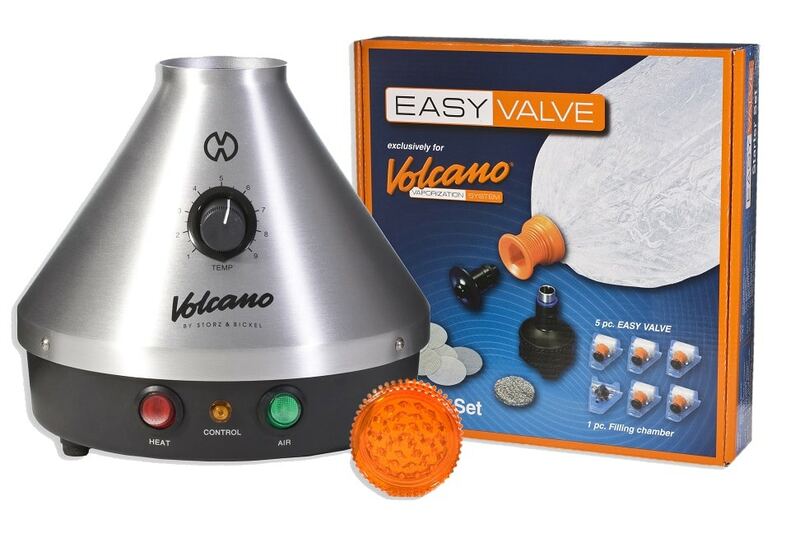 How Does The Volcano Vaporization System Work? One of the great things about the Volcano is its flexibility. There are a few different methods you can use for vaping. The first step in every case is to heat up the device. You do this by pushing the heat button. You then choose a temperature, and wait for 3-5 minutes. The light will be red while the device is warming up. Once it reaches the temperature that you selected, the red light will switch off. Balloon Method. 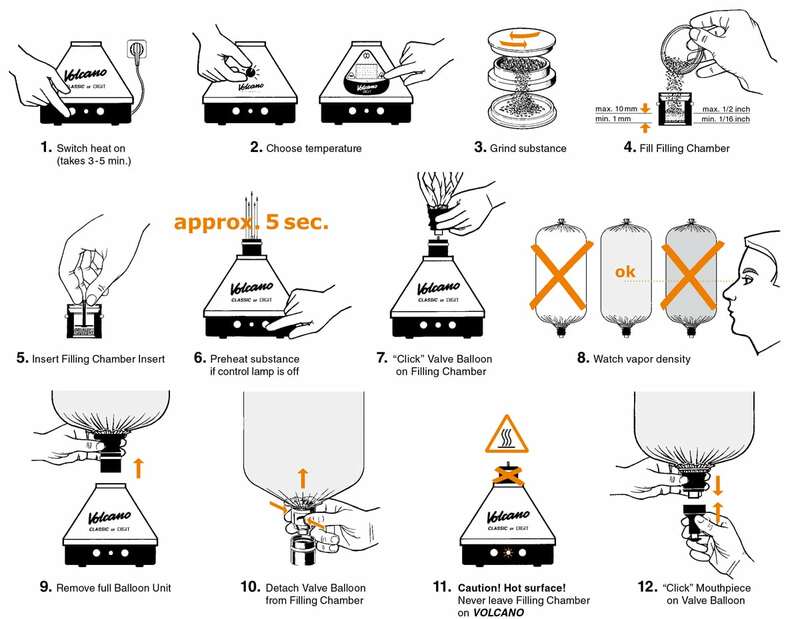 For this method, you remove the top of the Volcano Vaporizer to insert the herb chamber. You attach the valve and the balloon at the top. After it fills, you remove it, and then you attach the mouthpiece directly to the valve. Just remember to turn the fan off and remove your herbs once the balloon is filled so you do not go through your whole supply all at once. Whip Method. 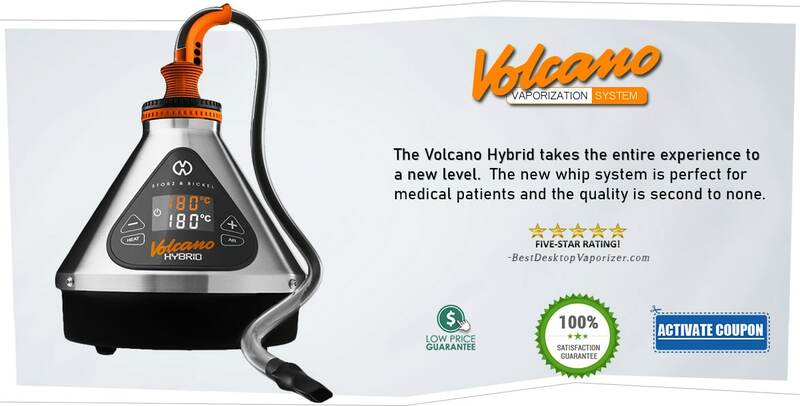 Many people do not realize this, but you can actually use a whip with the Volcano Vaporizer, but you do need to buy a Vapor Dome or equivalent product to do so—which is not manufactured by STORZ & BICKEL. 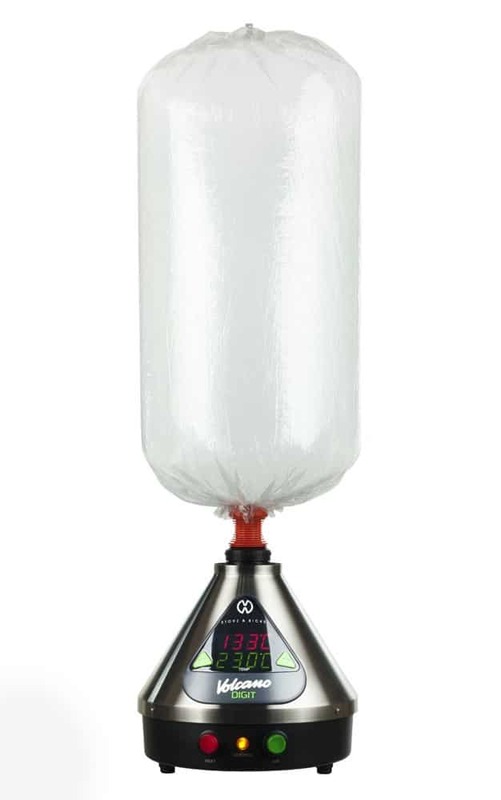 Personally I think the balloon method produces better results, but it is great that the Volcano Vaporizer provides you with options for your attachments. Also note that there are two types of valves available when you make your purchase: the Easy Valve and the Solid Valve. The Easy Valve: This pre-assembled valve is a great option if you just want to get started vaping right away. This is what I would recommend for a beginner. The Solid Valve: This valve does not come pre-assembled. You need to put it together yourself. What is awesome about it is that it lets you customize the size of the balloon. So if you know what you are doing (or are willing to learn), I would suggest the Solid Valve over the Easy Valve. How Does the Volcano Vaporizer Perform? As you probably figured out already, the Volcano Vaporizer is ridiculously easy to use. I went with the balloon method for my tests. Following the directions, I heated up the device, inserted my herbs and attached the valve and the balloon. It took under a minute each time for the balloon to fill completely. At that point, it’s just a matter of inhaling. I was really impressed with the quality of the vapor. I’ve tried other vaporizers before, but never before have I encountered one which produces vapor as smooth and aromatic as this. I thought the vapor was a little thin during my first test, but that turned out to be ridiculously easy to fix. It turned out it was my fault for not grinding the cannabis down enough. I tried again with a finer grind and got much thicker vapor. So you can easily adjust the density to your liking. One thing I will also say is that the consistency of the vapor is incredible, whether you go with a high or low density. With other vaporizers I’ve tried I’ve ended up with patches of vapor and patches of nothing. Every inhale I took with the Volcano Vaporizer had the same amount of vapor for a totally consistent experience. So does the Volcano Vaporizer live up to the hype? Absolutely. I could not be happier with the ease-of-use or the quality of the vapor. It is easy worth the price, even if you go for the more expensive Digital model. I can easily believe this is the best vaporizer for weed, dry herbs, oil, and just about anything else. Do not leave the vaporizer on for long periods of time. Doing so can lead to damage, even though the unit is heat-resistant. +1 for the Digital unit. Start with a low heat setting and work up to what you need. Your whole goal here is to use the lowest possible heat setting to produce the quality of vapor you are looking for. If you go too high, you will burn through your materials faster than necessary. You shouldn’t need to clean the vaporizer much (if at all). Because the materials you use and the vapor are contained in the chamber and the bag respectively, the vaporizer is pretty much maintenance-free. You do need to change the air filter every couple of years, and you need to periodically replace the Easy Valve and bags. The chamber can be washed in warm water with a mild detergent. If you go with the Solid Valve, you can actually clean it instead of replacing it, which is great. I’m not going to dance around the cost of the Volcano Vaporizer. Spending hundreds of dollars on a vaporizer isn’t for everyone. But there is a reason that the Volcano Vaporizer has become so legendary. It truly is the best desktop vaporizer out there. It is absurdly easy to use, requires very little maintenance, and allows you to use multiple methods and attachments. The vapor density is easy to control, and it has a smooth, even consistency and pure flavor and aroma which really cannot be beat. So if you vape a lot, dropping a few hundred dollars on the Volcano Vaporizer is just a smart purchase. You will actually save money over the long run because you won’t be wasting materials, and you will be protecting your health by getting away from the dangerous compounds associated with combustion. 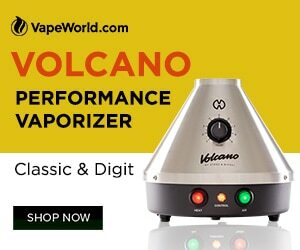 Can you take a risk on eBay or Amazon buy a cheap Volcano Vaporizer? Sure, but you’ll regret it when you realize that you saved $50 and bought a fake knockoff version. It is not worth the hassle, especially when you can get the Volcano on sale @ VapeWorld now. Use our 15% Volcano coupon code BESTNOW15. The Volcano Vaporizer is unrivaled in terms of ease-of-use, quality and durability. It will stand the test of time. The value it offers you now and over the long run is unmatched by any other vaporizer on the market. Click below to purchase it now!